This handy Cloning Adapter is the portable alternative to a SATA Docking station. Ideal for system builders/integrators, computer technicians and IT departments it acts as an external hard drive for 2.5″ and 3.5″ SATA hard disks as well as a convenient cloning station. It makes bit by bit clones (including Operating System and Partitions) of source HDDs onto target HDDs making it perfect for when upgrading to larger capacity HDDs. It can also act as a standalone cloning station when not connected to a computer. When connected to a computer the adapter allows bare HDDs up to 3TB in capacity, to be connected to a computer via eSATA (3Gbps) or USB 2.0 (480Mbps). Data recovery and backups are done without the hassle of installation. 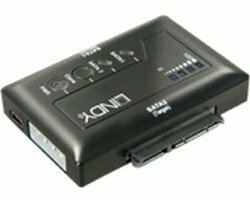 The dual SATA connector design allows two hard drives to be connected simultaneously, so that data can be copied between multiple drives of different types as 2.5″ and 3.5″ SATA drives are supported natively. For correct operation, the target drive should be unformatted and without any partitions. Older drives up to 10GB, and drives with older 28 Bit LBA addresses are not supported. The clone function for SSDs and HDDs >2TB is possible in some cases. However, LINDY does NOT support this feature! SSDs and HDDs >2TB use the new “Advanced Format” with sector size 4kB while SATA HDDs up to 1TB use 512 Byte sector size. More background information athttp://en.wikipedia.org/wiki/Advanced_Format and from your HDD and SSD manufacturer!